Swiss GNSS chip manufacturer u-blox has introduced a new precise timing GPS module, the LEA-5T, precise timing at the CTIA Wireless 2008 conference taking place this week in Las Vegas. Based on the company’s 50-channel, fifth-generation chipset technology, the LEA-5T is intended for such applications as telecom network synchronization, use in WiMAX base stations for home-based broadband networks, and data communication among geographically dispersed systems and devices such as NTP servers. The LEA-5T features a “Time Mode” function by which the GPS receiver assumes a stationary position, which can be programmed manually or be determined by an initial self-survey, reportedly enabling GPS timing using only one visible satellite. 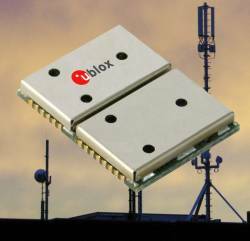 Using “SuperSense KickStart” weak signal acquisition technologies, u-blox 5 GPS chips and modules have an acquisition and tracking sensitivity of -160 dBm, according to the company. A built-in time mark and counter unit provides a globally synchronized time stamping and time-measuring functionality useful in applications such as seismic sensors or other applications with wide-area synchronization needs. Beginning next week (April 7), samples can be ordered from the company <www.u-blox.com/shop/> from next week onwards; mass production begins end of April.